How do you like the new Mass? I'm young enough to not remember how the Mass was done years ago, but I'm excited to see that the wording is being returned to a better translation of the original Latin. Sadly it can make responding at Mass a bit difficult for people like me who are just accustomed to saying those old prayers and phrases. And my kids have a hard time with it, too. 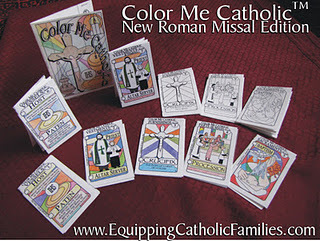 But Monica, at Equipping Catholic Families, has created Color Me Catholic: New Roman Missal Edition Cathletics Craft Kit to help the kids learn the new Mass. This kit includes 20 black and white templates to copy, color, and then create 10 mini books. The pages of these books go over the new phrases in the new Mass. They also cover the different vestments, symbols, church furnishings, parts of the Mass, sacraments and sacramentals. The pictures are very well done and interesting to look at and color. The books were a help to my older kids and my younger kids. I homeschool and I have two second graders this year who will be receiving their First Holy Communion. These books also helped me to teach them about the Mass and all the items they see at church. Visit Tracy at A Slice of Smith Life to read her review. Visit Laura's at Day by Day in our World to read her review. Visit Monica at Equipping Catholic Families to read more about her kit and consider purchasing one for yourself. I love the pictures! Thanks for your review! Blessings for Advent!